SpeakComputer free text to speech software is a suite of TTS text readers. The software is comprised of 6 separate text to speech readers and a text to speech parental control package. Now exporting Text to Mp3 is easier and quicker than ever before. The Text to Speech reader is a simple yet powerful TTS software reader that supports Text to MP3 export as well as Text to Wav export. The easy to use user interface allows you to change different pre-installed TTS voices, change the speed at which the Text to Speech reader reads back the text. You also have the “Echo Keys” feature, which if enabled, the Text to Speech reader will echo most keys which you pressed while typing. The Text to Speech Reader has a multiple document interface design allowing you to open many supported files within the same application. Basic document formatting is also supported. The Text to Speech web browser allows you to read the web pages by simply selecting the text on the web page and clicking “Speak”. The Text to Speech web browser also supports exporting Text to Mp3 and Text to Wav. TTS voice speed adjustment is also supported as well as selecting different TTS voices that are pre-installed on your PC. Standard zoom features are supported for those that may require it. The Text to Speech Mini Speaker is a great Text to Speech tool that will read any selected text from any application. Simply open an application, select the text you want spoken and click “Control + C”, then the mini speaker will read the text aloud. The Mini Speaker also supports Text to MP3 export. TTS voice speed is also supported as well as different Text to Speech voices. 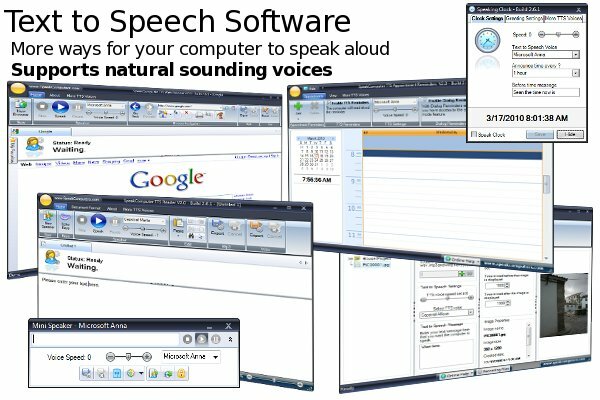 The Text to Speech Image Presentation software allows you to create TTS projects with which you can share with others using SpeakComputer software. Creative Text to Speech Presentation. The Text to Speech appointment reminders is a basic implementation of short and long term appointment software that can use the Text to Speech built in features to read out alerts as to when the appointment will take place. The Text to Speech clock starts automatically once it is installed. The Text to Speech Clock greets you by your login name (default, which can be modified) when ever you login. The TTS Clock also announces the time as set. The Text to Speech Guard is a parental control feature that works with the Text to Speech Reader, Web Browser and Mini Speaker applications. If turned on, the Text to Speech will read replacement words or simply skip the word that is to be read. Read more about the Reader, Web Browser, Mini Speaker, Appointment Reminders and Image Presentations.